In this photo, released by Australian Customs, a trawler is seen passing an iceberg in the icy, sub-Antartic seas of the Southern Ocean. Conservationists called Tuesday for the world's biggest marine protection zone to be declared around Antarctica, heralding the possibility of a global fight over its pristine waters. Conservationists called Tuesday for the world's biggest marine protection zone to be declared around Antarctica, heralding the possibility of a global fight over its pristine waters. As fishing stocks around the world become increasingly depleted, the Antarctic Ocean Alliance is urging the international convention tasked with managing the southern seas to establish a vast no-take network. 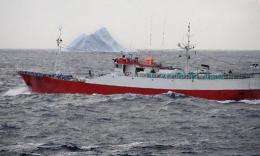 "The problem at the moment is that as fisheries resources around the world come under more and more pressure, there are going to be more distant water-fishing nations who want to go to the oceans around Antarctica to extract protein," the alliance's Steve Campbell told AFP on Tuesday. "And they are going to do it either legally or illegally." While the land continent has been under protection since 1991, Campbell said there is no such rule in place for the pristine waters around it, which are teeming with marine life -- much of which is seen nowhere else on the planet. The 25-nation Convention on the Conservation of Antarctic Marine Living Resources is set to decide on a network of marine reserves by 2012. Campbell said the alliance was calling for the creation of a reserve network "on a scale that hasn't been done anywhere else on the planet before because of the enormous value of the Antarctic wilderness to science and to humanity". The alliance's proposed protection zone, which would loop around the continent and include the Ross Sea, would help conserve close to 10,000 species including emperor penguins, minke and killer whales, seals and colossal squid. "There's a lot of separate national interest, I think there's a lot of industry interest here, but I don't think we can single anyone out as being the bad guy," Campbell said. "I think we've got a long way to go in terms of the political play to make this thing happen," he added. "At the end of the day everybody is going to have to contribute to a visionary outcome." Antartica is seen as a critical resource for studying climate change, with its ice cores providing valuable data on greenhouse gas levels and temperatures. The alliance's membership includes WWF, Greenpeace and the Antarctic and Southern Ocean Coalition.